A common requirement in Excel is to identify positive and negative numbers. This is usually to apply a different calculation to it e.g. a positive (credit) bank balance earns say 5% but a negative bank balance (debit or overdraft) incurs an interest charge of 10%. Although there are a number of ways to do it with special functions, the easiest way is to use an IF function. The question is how do we tell Excel to look for a positive or negative number. The logical operator generally needs to use a bigger than, equals to or less than. If this is TRUE, then we know it is a positive number. If it is not TRUE it must be a negative number (or a zero but this won’t have any impact in this case). If this test is TRUE then we have a negative number. If it is FALSE we have a positive number. 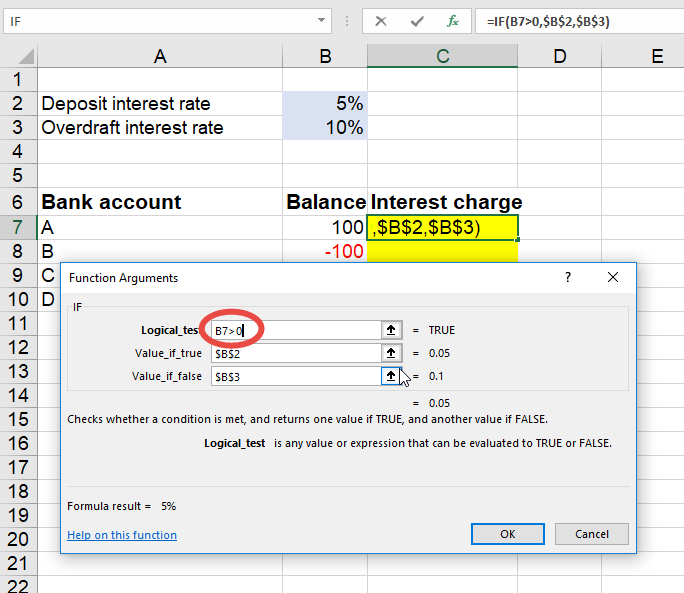 To learn more about the IF function, have a look at our free Excel Fundamentals Course.